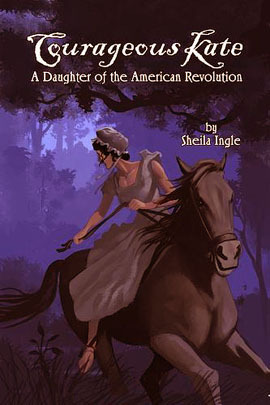 A fictional biography for young adults, Courageous Kate: A Daughter of the American Revolution is the compelling account of a heroine and a young mother who rode out from her Carolina backcountry home to warn Patriot militias of enemies on the move. Kate Moore Barry served as a scout and a spy and is credited with helping Gen. Daniel Morgan defeat the British at the Battle of Cowpens, a turning point in the war for independence. The author weaves together history, folklore and fiction to create a memorable story about three generations of Scots-Irish settlers who built a life in the wilderness of the South Carolina Upcountry during the 1700s. Illustrated by John Ingle, Courageous Kate tells riveting stories of Kate’s encounters with cruel Tories and of the day she tied her youngest child to a bedpost so she could ride out to alert Patriot militiamen about gunfire at her parent’s nearby home. I thoroughly enjoyed Courageous Kate, especially being a great x4 granddaughter of Andrew and Margaret Catherine Moore Barry. I’m interested in joining DAR but Kate Moore is shown as only a traditional patriot (no written proof).! Does Sheila know of any proof of her being a heroine? I think it would be fantastic if women could go into DAR under Kate Barry!